As a trial, let's search for books that have the word architect in the title. You'll notice that these books have rapidly increased since about 2000. This might be a sign of an advancing historicization of the twentieth century's masters and a parallel groping, with reflections and questions as to the former image of architects, after a new image of architects. Along such a line of groping, 3.11 actualizes a simple theme in a sense such as how to recover the relation between architects and societies. Such a sway or theme reminds us of various historical contexts. And obviously the discussion about architects and societies hasn't just now started. There has been a left-wing genealogy since before the war, and also among postwar modern architects were some who struggled with actual cities and properties, or societies and systems. The image of architects who worked on various subjects while rooting themselves into concrete local communities started to appear about 1970. Trials of collaborative designs that eliminate heroic proper names also form one of the veins that have been running continuously underground since the early postwar period. But the architects' desire to be linked with society might sometimes be nothing but the problem of those architects with scant relation to social reality, as described by 1950s theories of tradition and theories of peoples. Of course, it doesn't mean that the desire is therefore deniable. And, seen in perspective, architects after the 1970s and especially in the 1980s turned in upon themselves, bracketing the sociality and politics around architecture, and soon became swallowed in a sea of consumption. In this feature, we cannot in good balance comprehend all these themes. But after becoming aware of bias, for the moment we tried, albeit from limited viewpoints, to think about the historical contexts that entwine the architects' self-definitions. 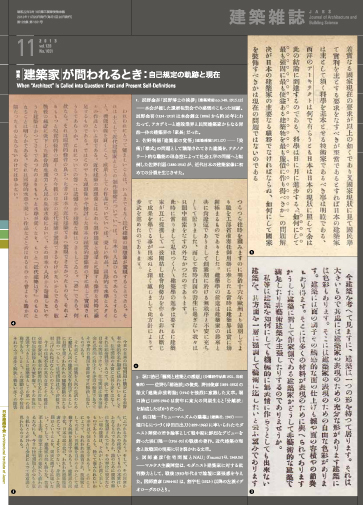 Part 1, "Architects and Postwar Japan," first presents an interview with editor Keiichi Taira (advisor to JABS). It is a valuable testimony to architectural thinking in postwar Japan and a powerful message for us today. Following that, we show the historical perspective that the editorial board supposed when planning this feature, in other words, an outline of historically repeating structures concerning the image of architects. In part 2, "A Genealogy of the Image of Architects in Modern Japan," after Yoshitake Doi presents a global and universal frame that relativizes Japanese architects from a broad perspective, we construct tracks of architects' self-definitions in Japan till about the 1960s in a discourse that retraces them especially from viewpoints of society or systems: Yoshihiro Sato on the subject of designers' class-consciousness from a reexamination of Sousha, Yosinori Date on the RIA's groping as an architects' community system after the image of function, and Kei Minohara on the function sense of the postwar generation's Masato Otaka. While reexamining the dualism of registered architects and architects, Kiyotaka Hayami views the future. And a discourse by Naohiko Hino structures a clear large-boned matrix and thus catches what the base is in the strained relations of power that have composed modern Japanese architects as a whole, and simultaneously searches the historical contexts of the subject that today should be questioned, the discontinuation of pre-1960s composition. In part 3, we consider architects after 3.11. First, a discourse by Kozo Kadowaki treats "architects as collective intelligence" in terms of the meaning in modern history and the issue today, both in a framework that bridges architectural production and social transformation. How then, in the field of recovery from the Great East Japan Earthquake, has the image of architects been reconsidered? These themes are taken up: Shoko Fukuya on the deterioration of the image of architects and a cross section of blind groping in ArchiAid's disaster-area support, Yasushi Takeuchi on the subjects of the community architects' image that are based on various active experiences in disaster areas, Toshihiro Sato on the tracks of his unique activities and thoughts that include the relation with disaster-area communities, and Michio Ubaura rather on planners' functional issues in relation to architects. And we insert the editorial board's reference guide for this feature. History repeats itself, Marx said, first as tragedy, then as farce. The word that doesn't examine its own footing historically is too naïve. This feature is a small essay collection compiled from a little swaggering awareness of the issues. This issue has been edited by Akihito Aoi (Meiji University) and Yasushi Takeuchi (Miyagi University).